After a week in Maui, Hawaii, my wife, Carrie, and I were driving back to the airport. As we passed, she could see me staring longingly at the Napo’opo’o Lighthouse; which I had never managed to stop and photograph. I was ready to leave Maui without snapping a shot of the lighthouse, but after some encouragement to the tune of, “were not in a rush; you know you want to stop,” I turned the car around and went back. Special thanks to Lighthouse Friends for the following lesson. “Captain Cook embarked on his third voyage of discovery in 1776 aboard the Resolution, and, after a stop in Tahiti to return a native picked up during his previous voyage, Cook happened upon the Hawaiian Islands in January of 1778. After two weeks of trading and friendly interaction with the islanders, the Resolution sailed north in search of the fabled Northwest Passage. The next several months were spent mapping much of the west coast of North America, with the expedition reaching as far north as the Bering Strait. As fall was setting in, Cook headed south to warmer climes. On the morning of January 17, 1779, Captain Cook and his two vessels entered the protected waters of Kealakekua Bay during the height of a religious festival honoring the god Lono. The Hawaiians reportedly greeted Cook as Lono incarnate and honored the captain during the remainder of the celebrations. After the festival, Cook and his crew left the islands but encountered a fierce storm that snapped the foremast of the Resolution. After returning to Kealakekua Bay for repairs, a schism developed between the islanders and the explorers, and one of Cook’s small launches was stolen. Planning to take the chief captive until the vessel was returned, Cook rowed ashore with several of his crew. The abduction, however, was thwarted, and Cook and his men retreated to their boats on the beach. While trying to return to the safety of the Resolution, Cook was struck on the head and stabbed to death along with four of his men. In 1908, a tall wooden mast topped with a lens lantern was placed on the point just west of where Cook fell to mark Kealakekua Bay, regarded as the finest anchorage on the western coast of Hawaii. 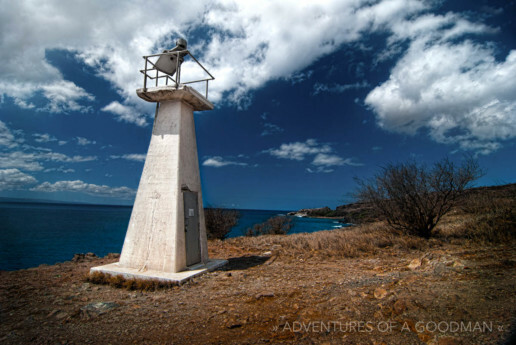 Today, a concrete pyramidal tower, built in 1922 just west of the Captain Cook Monument, serves to mark Cook Point and the northern entrance to Kealakekua Bay, a marine sanctuary frequented by kayakers and snorkeling expeditions. The ground on which the Cook Monument stands was deeded to the British Government and a ship is reportedly sent by the British to perform regular maintenance.